Why is Nestle Called Nestle? What does breastfeeding have to do with your favorite chocolate treat? 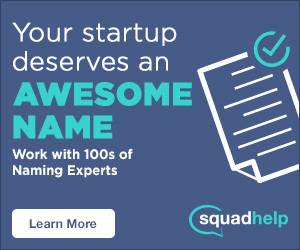 A lot more than you might think. One of the biggest players in the food industry built their empire on the need some women had for a substitute for breast milk. Fast forward 150 years, and this company now owns hundreds of iconic brands across many categories—and is still growing. By 1867, Henri Nestlé had tried his hand at various businesses, including the sale of mineral water, fuel oil and lemonade. It was in this year that he launched what would be his most successful product to date: Farine Lactée Henri Nestlé. This breast milk substitute was hugely profitable, and it allowed Henri Nestlé to expand his business. 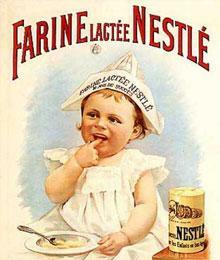 In 1874, Nestlé’s business, called Société Farine Lactée Henri Nestlé, began offering a condensed milk product. Henri retired shortly thereafter and sold his company to a trio of businessmen. In 1905, the business merged with its top competitor, Anglo-Swiss Condensed Milk Company, and Nestlé was formed. Thus began a long tradition of Nestlé mergers and acquisitions that continue to this day. Many think of Nestlé as a company with Swiss origins, but founder Henri Nestlé wasn’t Swiss. He was born in Germany and moved to Switzerland in his 20’s. The business began in Vevey, Switzerland, and Nestlé is still headquartered their today. Even if you’re not a fan of chocolate, chances are good that you use products that are part of the Nestlé family. They own hundreds of major brands, from pet products like Friskies, Tidy Cats and Purina Beggin’ Strips, to convenience foods such as Cheerios, Lean Cuisine and Tombstone Pizza. And, yes, they are still in the baby game. Nestlé owns two dozen international brands in the infant category. 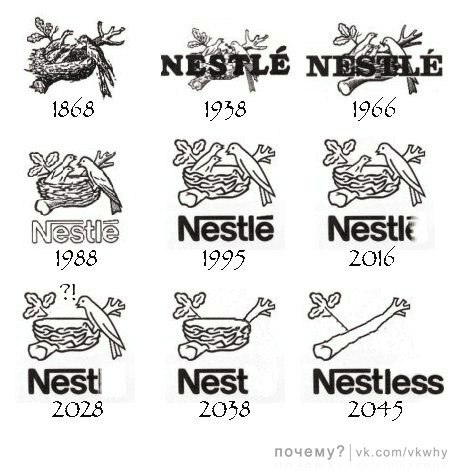 Why is Nestlé Called Nestlé? The abbreviated business name Nestlé wasn’t used until 70 years after Henri sold his business. With many new products being introduced, including the company’s first chocolate bar in 1904, the original name was no longer a true reflection of the business. In addition to the inspiration for the name, the familiar logo of three birds in a nest is also thanks to Henri. He was one of the first businessmen in Switzerland to use a logo to grow his brand. The original logo is homage to his family’s coat of arms, featuring a nest with a single bird. Henri soon modified the logo to show a mother bird feeding her babies—a nod to the infant milk he sold. Today, a version of that logo is still used on Nestlé products around the world. 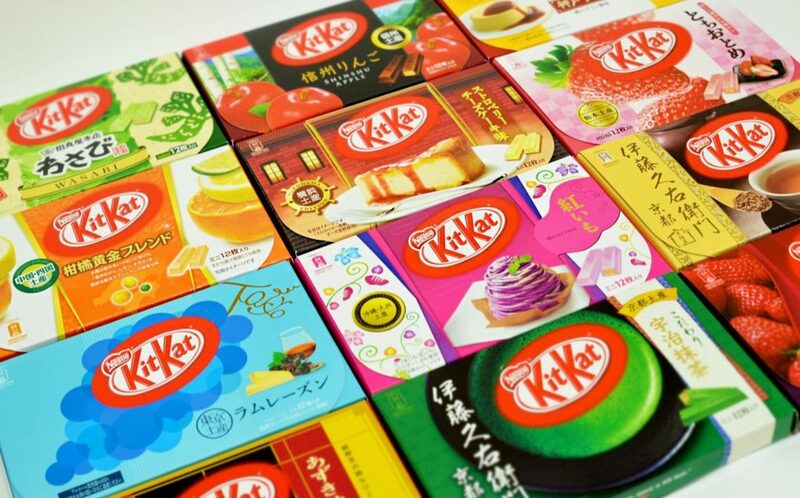 Nestlé products are popular in Japan, but no sweet treat is more popular than Kit Kat, with over 300 flavors, including Matcha, Purple Sweet Potato, Wasabi, Easter Custard Pudding and Sakura Saki. While the selection in U.S. stores is usually limited to chocolate, dark chocolate, and the occasional limited edition flavors, Westerners can try some of the flavors offered in Japan by ordering them on Amazon. The treat is so popular in Japan than there are entire stores dedicated solely to Kit Kat bars. In 2015, Nestlé sold a very limited number of gold-coated Kit Kat bars to celebrate one million visitors to these specialty stores. The candy bars, called the Sublime Gold Kit Kat, were covered in gold leaf and sold for a reasonable 2,016 yen ($16.41 U.S.). Only a lucky few were able to get their hands on the limited edition because Nestle only created 500 of them.